Do you ever feel guilty about complaining about your bad day? I always kind of do. I always feel guilty because I’m pretty sure there’s someone out there in the world that’s having an even worse day than me. I’m sure of it. Bad days happen. Just like bad hair days. Mine are usually exclusively related. If I wake up and my hair has a nice swing to it, I’m generally pumped and my positive vibing just roles right on through everything. So, instead of telling you why yesterday was super lame (because that’d be lame), I’m going to show you my current late-night exercise, as of late, that I’ve started to take very seriously due to its therapeutic results. Enter: my “Cute Animals” board on Pinterest. Lately, I’ll sit in bed with my laptop and search for cute animals photos. Because is there anything better than staring at a pic of two kangaroos slow-dancing? No. Is there anything more hilarious than seeing pigs fly? No. Is there anything more adorable than two French bulldogs cuddling? I mean…I challenge you to find it. I urge you to start your own cute animals board. Seriously. Are you jealous of my life yet? Well you should be because I have awesome scones in my kitchen that can soon be baked up in yours too, if you like. After two recipe failures, I wanted something tried and true and good. I made a version of these scones. But then, I was kind of like, Meh, not bad but not great. So I made them again, tweaked a few ingredientses until I got them to point where they were like, Whoa, YES! 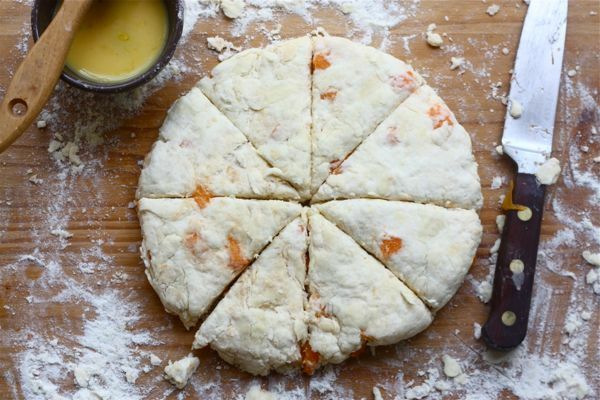 These are the scones I want to make in PJs on a Saturday morning. I’ll admit that summer is tough for me cooking-wise. 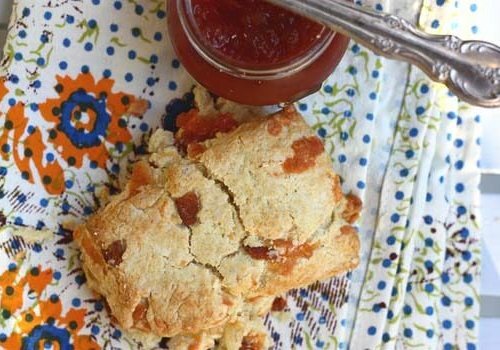 Everything I enjoy cooking/baking are things that are more fall and winter appropriate; hence the name of this blog, but these scones feel fresh and summer-like. Fresh apricots are everywhere right now. Grab some, mix them in with flour and butter bits. It’s a good move. These scones aren’t terribly sweet, as I think most scones shouldn’t be. The little apricot bites give them the perfect amount of sweetness. They’re tender with a slight tang. I like them. And since they aren’t very sweet, I like to pair them with a little bit of softened salted butter and a drizzle of honey. So good! 1. Bring a small pot of water to a boil. Gently place apricots in water and allow to simmer for 1 minute. While water is going, prepare an ice bath. Transfer the apricots from the boiling water to the cold water. When cool enough to handle, using a pairing knife, peel the skin off of the apricots. Cut them into a dice and set aside. 2. Adjust oven rack to middle position and preheat oven to 425 degrees F.
3. Place flour, baking powder, baking soda, sugar, and salt in large bowl. Whisk together until thoroughly combined. 4. 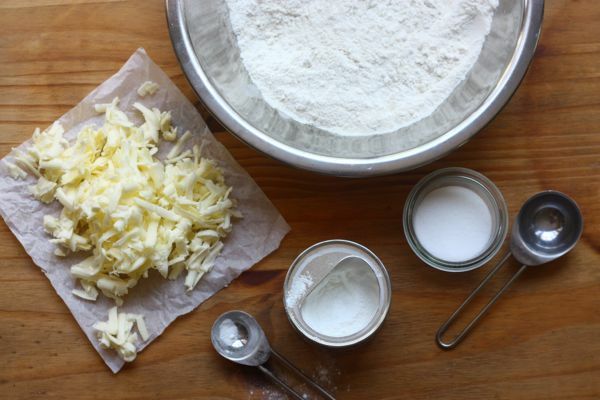 Using a box grater, grate the cold butter into the flour mixture. Working quickly, and using your hands, mix the butter into the flour mixture until it resembles a coarse meal. 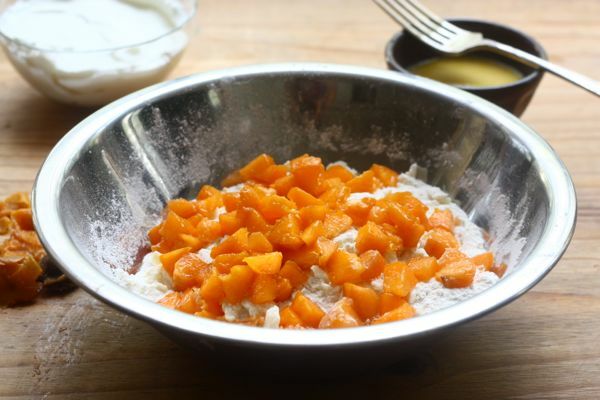 Gently stir in apricots, being sure to coat them in the flour mixture. Measure out the buttermilk in a measuring cup and add the egg; beat until combined. Pour in the buttermilk and mix until the dough begins to form, about 30 seconds. 5. Transfer dough and all dry, floury bits to a liberally floured countertop and knead dough by hand just until it comes together into a rough, slightly sticky ball, 5 to 10 seconds. Pat the scones flat to a 1-inch thickness. 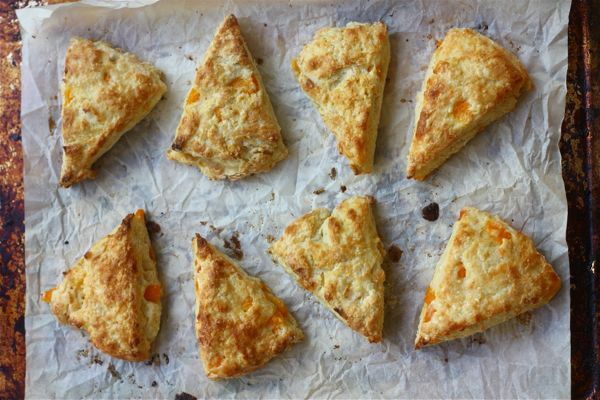 You can cut the scones into 8 wedges or you can use a biscuit cutter. I did the former and ended up with 8 triangular scones. Place the scones on a parchment-lined baking sheet. Beat an egg with a tablespoon of milk together and brush the tops’ of the scones with the egg wash.
6. Transfer the baking sheet to the hot oven and bake until scones are light brown, 12 to 15 minutes. Cool on a wire rack for at least 10 minutes. Serve warm with butter and a drizzle of honey. Such a great scone! I love apricots, so any excuse to use them is great! Omg. I need one of these right this minute. Totally going to get me some apricots and do this up! If I tried this with mangos, would I parboil them the same way? Yes, but they may have to boil for longer. I imagine mangos with their tougher skin might need 3-4 minutes of boiling. I’d check the skin at the 2 minute mark to see. Mangos in scones sound sooooo good! Dang, now I’m going to have to make these. Your trip look so lovely! Yes, I hate complaining about my bad days too like it’s the end of the world when some people have it worse, way worse. But man, it’s so good to whine though. 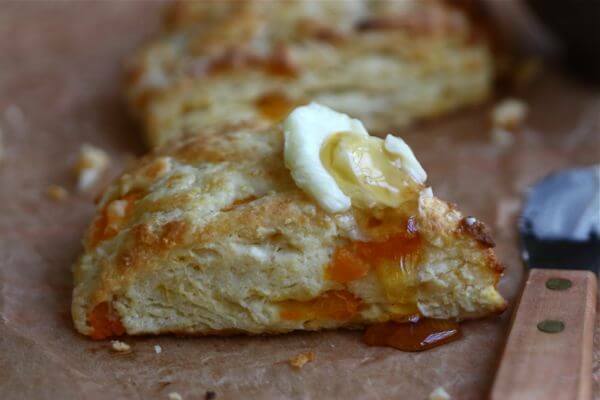 Apricots in scones is a lovely idea. I have not mastered adding fresh fruit in scones, somehow it always ends up a little too wet even after baking for a long time. Did you shave your cold butter? Is that what is in the picture? That is awesome! Whining is awesome. You just have to find one person to do it to–not the whole world. I think that’s the trick. And yes! I shave the butter. It makes it easier to mix in with the flour. I have a board dedicated to cute Pugs. You are so right about it’s therapeutic qualities. I still feel kind of crazy pinning stuff to it though. I totally want to make these over the weekend! Heading out to buy some apricots now! I never feel crazy about pinning cute animals. Is that weird? No way. You own it girl! I should do the same! Oh yum. I’m thinking these need to be made this Saturday morning! Yay scones! And I see they are indeed triangular. 🙂 Love the apricots–I might add some slivered almonds too! One of the things I love most about your recipes is that you try to make them easy and understandable, even for cooking rookies like myself. Thanks to you I’m homing my skills in baking and cooking. Thanks for that! 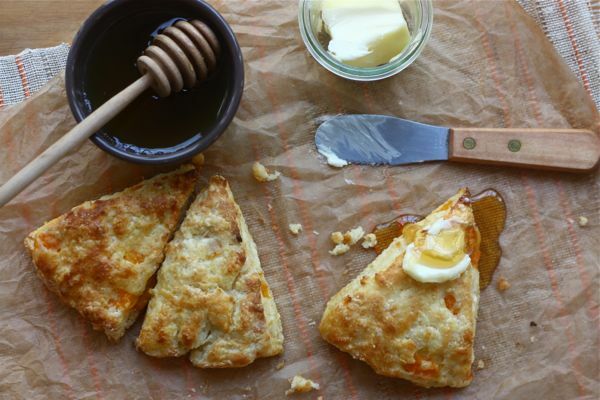 The picture with the butter and honey has me crazy in love Beyonce-style with these scones. Yum! Any chance bing cherries would work here? I have a huge bag of cherries in the fridge and cherry + chocolate chunk scones sound yummers. I have all ingredients to make these, but no apricots at the moment. WHOA! Yes, they should work with cherries. I’d cut the cherries in half since they might be a little too big for these scones. But you’ve inspired me to make something with cherries and chocolate. That needs to happen! Cute animals on Pinterest??? Sign me up! These scones look SO good. Umm also, you cute animals board is AHmazing. I didn’t even need a pick-me-up and now I’m just giddy. I don’t make scones for some reason but yours look very interesting with the apricots and cheese. Great photos. Oh that’s not cheese–it’s grated cold butter. But I bet cheese would be awesome in these! Oh, my! These remind me of the scones I used to make. I would take my standby biscuit recipe, add a tablespoon or two of sugar, a splash of vanilla extract, fold in some dried chopped apricots, then top with a generous sprinkling of vanilla sugar. They were so good, but I honestly never thought about using fresh apricots (how silly of me)! I really need to give this recipe a go! awww, I love the cute animals search – a nice ritual to end the day happy. I love apricot scones but usually use dried ones. Definitely giving these a try! Have you tried clotted cream on scones? It’s very British and oh-so-yummy. Oh yes I have. I love it! These look so good. I don’t make scones too often. Think I need to change that and try these beauties out. Adrianna, I have just nominated you for the Very Inspiring Blogger Award on my blog because A Cozy Kitchen is one of my favourites. If you wish to pick up the award, please come visit my blog. i think complaining about your life is wonderful. sometimes. it’s true there’s always people who have it worse (example – i’m currently in the hospital and my dad’s in the ICU) but i am still real about being annoyed with the little things – temperature, weird food, annoying people, etc. it’s reality, right? 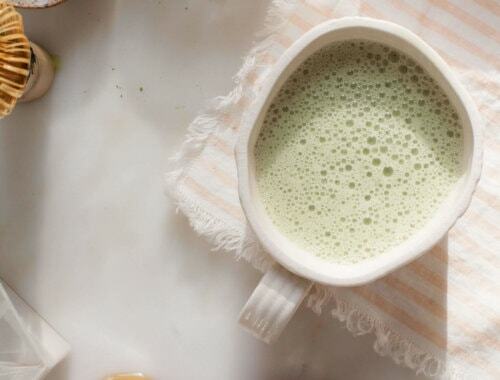 Oh yes!i’m in love with your blog, recipes, photography and instagram. Thanks for all this inspiration! Awesome idea to shave/grate the cold butter–I think I’d heard this tip before, but always forget it. That might work great getting butter to soften more quickly or with pie crusts too?? I made these and they were really great! Thanks for the recipe! YAY! So awesome to hear. This sounds like a recipe I HAVE to try. Already printed out, and ready to roll. These look and sound amazing. I could just imagine them warm drizzled with honey. Yum! So i have been trying various apricot scones recipes to share a family tradition of fresh apricot scones on Christmas morning with family and friends…and just came acrosse yours! Could I & what would your instructions be to make the dough, then freeze, so I can package and give as gifts? 1. 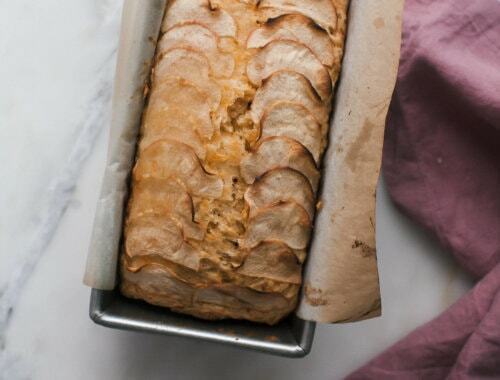 Make the dough, cut out the scones and place them on a lined baking sheet. Transfer the baking sheet to the freezer and freeze for 30-45 minutes, and until hard. Place the scones to a freezer-safe plastic bag, placing a piece of parchment between each one, and freeze until you’re ready to bake them. Before baking, brush the tops with egg wash and add a few more minutes on to the baking time, about 5 additional minutes. Love this recipe – I add a but of fresh tiny cut rosemary and some pepper for savoury angle. Like many of your readers, I have used the dried apricots, but fresh sounds better! Living in a very rural area, so can’t always find them. Sounds awesome….